The Surface Water and Ocean Topography (SWOT) mission will provide an unprecedented view of the global ocean, mapping out two parallel 50-km-wide swaths of sea surface topography with 2-km pixel spacing every 20 days (e.g. Fu et al., 2012; Peral, 2014). Because of the novelty of its measurements, SWOT will introduce new challenges for data retrieval and interpretation. SWOT challenges will be especially acute for the smallest length scales that SWOT resolves for three reasons. First, ocean structures typically have red sea surface height (SSH) spectra, meaning that the smallest scales in the ocean have the smallest signatures and therefore are hardest to detect and interpret. Second, small spatial scales typically correspond to rapid temporal motions, that will evolve significantly between consecutive passes of SWOT, thus necessitating a dynamical framework to interpret the time-evolving satellite fields. Third, the small scales will be entirely new (e.g. Arbic et al., 2015; Klein et al., 2015); current gridded altimeter products from AVISO are smoothed in time and space to capture variability on scales of O(100 km) (e.g. Le Traon and Dibarboure, 2004; Dibarboure et al., 2011), and even along-track products retain little structure for scales less than 20 to 30 km, so we do not have an existing suite of measurements to tell us what physical processes will govern oceanic behavior at these small scales. Recent results indicate that at the smallest scales that SWOT measures, geostrophic dynamic height may have less impact on sea surface height signal than surface waves, tides, and internal waves (e.g. Wang et al., 2010; Callies and Ferrari, 2013; Rocha et al., 2016a,b). The objective of our research in support of SWOT is to develop 4-dimensional variational assimilation (4d-var) methods that include both quasi-geostrophic and tidal motions in order to build the capabilities to map, evaluate, and interpret SWOT observations, with a specific focus on the California Current region, which has been identified as one of the target regions for calibration and validation of SWOT (Wang et al., 2016). Our aim is to distinguish balanced, geostrophic motions from the myriad other processes that influence SSH variability at the ocean surface. Figure 1: The color map shows a snapshot for 16 April 2012 of the surface speed from the California Current System State Estimate (CASE). The dots mark the locations of the NDBC buoys (black filled), and the CDIP buoys (white filled). The potential calibration and validation site for SWOT is marked as a red diamond, and nadir calibration and validation orbit ground track of SWOT is in the dashed line gray. The California Current System is one of the most well-sampled regions of the ocean, with a multi-decade record of observations and present-day monitoring from multiple observational platforms, including high-frequency (HF) radars, gliders, wave–buoys, remote sensing satellites, and ocean moorings. Taking advantage of the wealth of observations in this region, a state estimate of the California Current System (CASE, Todd et al., 2011, 2012; Mazloff et al., 2014) was developed as a regional configuration of the Estimating the Circulation and Climate of the Ocean (ECCO) assimilation version of the MITgcm (http://www.eccogroup. org; Wunsch and Heimbach, 2013), providing an efficient way to synthesize ocean observations from multiple data sources. The CASE domain extends from 27.2°N to 40°N and from the California coast to 130°W (Figure 1), with open boundary conditions to the south, west, and north. In its current configuration, the model has 72 vertical levels and a horizontal resolution of 1/16° (~7 km), with 250 m, 500 m, and 1 km grids available in a nested domain centered on the Santa Barbara Channel region. Tidally-generated variability is expected to be a significant component within the SWOT signal. In principle, barotropic tides are repeatable and can be removed from the SWOT data in much the same way that tidal signals have been removed from nadir altimeter data. However, predictable barotropic tidal motions may not account for much of the high wavenumber variability seen by SWOT. Instead tides generate internal wave motions that scatter over a broad range of frequencies and wavenumbers (e.g. Simmons et al., 2004). In previous work, we tested the inclusion of tides in our forward simulations both at mesoscale resolutions (Ponte and Cornuelle, 2013) and in a nested model that resolves scales of just a few meters (Musgrave et al., 2015). We are now incorporating altimeter-based tides into the CASE state estimate setup, using the TPXO framework (http://volkov.oce.orst.edu/tides). We have 250-m, 500-m, and 1-km grids configured, and we have run the 1-km case for 2 years. Temperature, salinity, and velocity fields look reasonable, and we are in the process of validating the tides (Figure 2). Super computer resources appear adequate for the runs that we anticipate: the 1 km Santa Barbara Channel model runs on just 32 cores, and the 250 m version will use 500 cores. Internal waves are generated when sufficient vertical resolution is available for tidal energy to propagate vertically (e.g. Rocha et al., 2016a). By using 72 levels in the vertical in the relatively shallow waters of the California Current, the MITgcm should be able to support a relatively energetic internal wave spectrum. A second innovation in our state estimation effort is the inclusion of surface waves, which are crucial for the dynamics of the upper ocean, not only because they determine the sea state, but also because they mediate exchanges of momentum, heat, energy, and gases between the ocean and the atmosphere. Understanding the physics of processes that control air-sea exchanges will lay the groundwork for incorporating their effects into model parametrizations, leading to better climate model representativeness and predictions. In this context, we have been investigating (i) how surface currents modulate the wave field at meso and submesoscales (e.g. Ardhuin et al., 2017), and (ii) how surface waves contribute to vertical mixing in the upper ocean. Even though individual waves will not be detected with SWOT’s 2-km resolution over the ocean, SWOT retrievals of SSH will be influenced by waves in analogy with the sea state bias (SSB) experienced by nadir altimeters (Fu and Glazman, 1991; Peral et al., 2015). In nadir altimetry, the SSB is generally decomposed into instrumental error and electromagnetic (EM) bias, both associated with the fact that the distribution of wave heights in the ocean is not exactly Gaussian (Fu and Glazman, 1991; Melville et al., 1991). While the instrumental error is attributed to the design of the altimeter itself, the EM bias is intrinsic to the way that the radar pulse interacts with the sea surface; the accuracy of SSH measurements from altimetry is directly limited by the effect of surface waves. Theoretical models of the EM bias predict a linear relationship between the EM bias and the significant wave height; however, other characteristics of the sea state, such as the degree of wave development (wave age), the wind speed, and the direction of the waves with respect to the satellite boresight, also contribute to the EM bias. Thus, as satellite altimeters evolve to resolving finer scales, precise knowledge of the wave field will be key to understanding how surface waves may contribute to the error budget of SSH measurements. 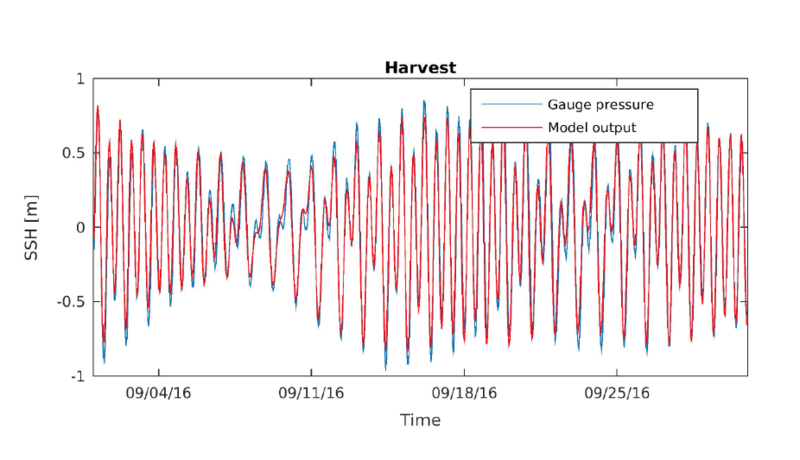 Figure 2: Time series of the model output and the pressure gauge sensor at Harvest. A realistic representation of the wave field in the California Current will provide a tool to complement the error budget analysis of Peral et al. (2015), and it will help in interpreting the SSH signal measured by SWOT. Remote sensing satellites are currently the only way to monitor significant wave height at global scales. As altimeters become capable of resolving smaller scales, the interpretation of the sea state bias might have to be revisited in order to continue improving wave products. High-resolution output from wave models, used in tandem with satellite observations, will provide an essential tool for this type of investigation. Our work to date has focused on laying the groundwork for assimilation of the full SWOT signal, with a particular focus on the intensive observing period carried out in the Santa Barbara Channel region of the California Current in September, 2016 as part of an Office of Naval Research Multidisciplinary University Research Initiative on passive acoustics. 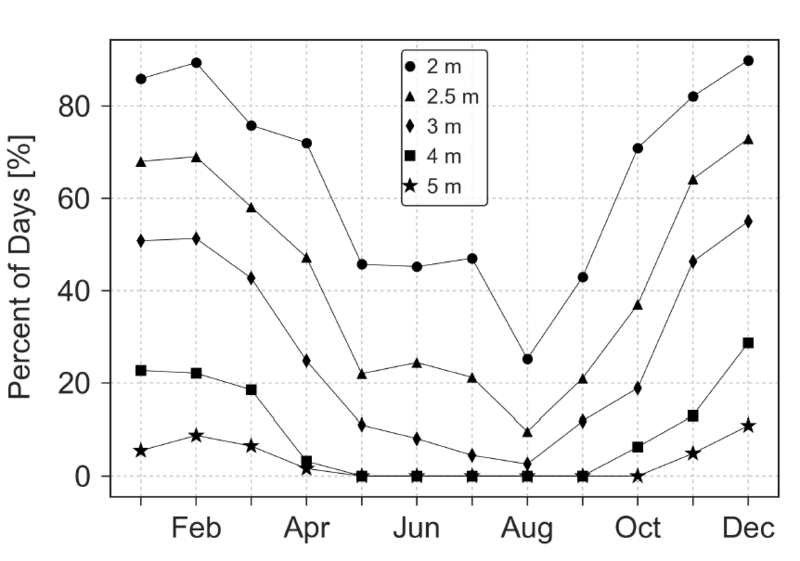 As an example, tests with the TPXO tidal model incorporated into CASE show good agreement between pressure gauge observations and model time series of SSH at Harvest (Figure 2) and other locations, with amplitudes for the M2, S2, N2, K1, O1, and Q1 tidal components typically differing by less than ±10%. As a preliminary to coupling CASE to the wave model, we have assessed the wave climatology in the California Current region. Results show that the significant wave height at the potential calibration/validation site off the California coast is above the 2 m threshold specified for the projected SWOT performance over 60% of the time (Figure 3); however, this value can be as low as 25% in August. Figure 3: Average percentage of days per month for which the significant wave height at the SWOT calibration/validation site (red diamond, Figure 1) is above a given threshold. To summarize, our model development work is incorporating tide and wave modeling capabilities into the California Current State Estimate, CASE. This will provide a structure to evaluate the small-scale, unbalanced or ageostrophic motions that are likely to be significant contributors to the SWOT signal. It will also develop the infrastructure to eventually constrain the state estimate with the high spatial-resolution SWOT observations. Arbic, B.K., F. Lyard, A. Ponte, R. Ray, J. G. Richman, J.F. Shriver, E. Zaron, and Z. Zhao, 2015: Tides and the SWOT mission: Transition from science definition team to science team. Tech. rep., CNES-NASA, http://swot.jpl.nasa.gov/science/whitepapers/. White Paper. Ardhuin, F., S.T. Gille, D. Menemenlis, C.B. 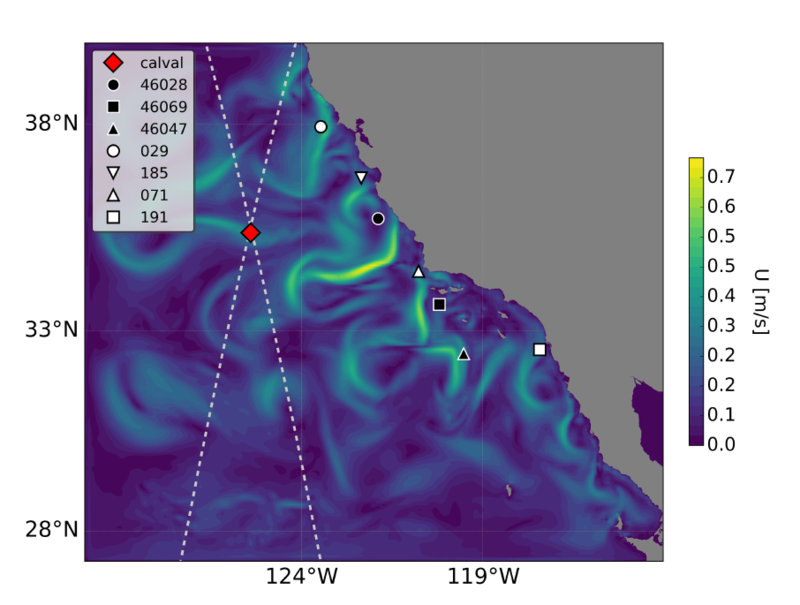 Rocha, N. Rascle, B. Chapron, J. Gula, and J. Molemaker, 2017: Small-scale open ocean currents have large effects on wind wave heights. Journal of Geophysical Research: Oceans, n/a–n/a, doi:10.1002/2016JC012413. Callies, J. and R. Ferrari, 2013: Interpreting energy and tracer spectra of upper-ocean turbulence in the submesoscale range (1–200 km). J. Phys. Oceanogr., 43, 2456–2474. Dibarboure, G., M.-I. Pujol, F. Briol, P.-Y. Le Traon, G. Larnicol, N. Picot, F. Mertz, and M. Ablain, 2011: Jason-2 in DUACS: Updated system description, first tandem results and impact on processing and products. Mar. Geodesy, 34, 214–241. Fu, L.-L., D. Alsdorf, R. Morrow, E. Rodríguez, and N. Mognard, (Eds.) , 2012: The Surface Water and Ocean Topography (SWOT) Mission: Wide-Swath Altimetric Measurement of Water Elevation on Earth. Jet Propulsion Laboratory, JPL Publication 12-05, http://swot.jpl.nasa.gov/files/SWOT MSD final-3-26-12.pdf. Fu, L.-L. and R. Glazman, 1991: The effect of the degree of wave development on the sea state bias in radar altimetry measurement. Journal of Geophysical Research: Oceans, 96 (C1), 829–834. Klein, P., et al., 2015: Mesoscale/submesoscale dynamics in the upper ocean. Tech. rep., CNES-NASA, http://swot.jpl.nasa.gov/science/whitepapers/. White Paper. Le Traon, P.-Y. and G. Dibarboure, 2004: An illustration of the contribution of the TOPEX/Poseidon–Jason-1 tandem mission to mesoscale variability studies. Mar. Geodesy, 27, 3–13. Mazloff, M. R., S.T. Gille, and B.D. Cornuelle, 2014: Improving the geoid: combining altimetry and mean dynamic topography in the California Coastal Ocean. Geophys. Res. Lett., 41, 8944–8952. Melville, W., R. Stewart, W. Keller, J.A. Kong, D. Arnold, A. Jessup, M. Loewen, and A. Slinn, 1991: Measurements of electromagnetic bias in radar altimetry. Journal of Geophysical Research: Oceans, 96 (C3), 4915–4924. Musgrave, R.C., J.A. MacKinnon, R. Pinkel, J.D. Nash, and A.F. Waterhouse, 2015: The influence of three-dimensionality and sub-inertial trapped internal tides on near-ridge turbulence at the Mendocino Ridge. J. Fluid Mech., to be submitted. Peral, E., 2014: KaRIn: Ka-band radar interferometer on board processor (OBP) algorithm theoretical basis document (ATBD). Tech. Rep. D-79130, JPL KaRIn OBP ATBD v2a.docx, Jet Propulsion Laboratory. Peral, E., E. Rodríguez, and D. Esteban-Fernández, 2015: Impact of surface waves on swot’s projected ocean accuracy. Remote Sensing, 7 (11), 14 509–14 529. Ponte, A.L. and B.D. Cornuelle, 2013: Coastal numerical modelling of tides: Sensitivity to domain size and remotely generated internal tide. Ocean Modelling, 62, 17–26. Rocha, C.B., T.K. Chereskin, S.T. Gille, and D. Menemenlis, 2016a: Mesoscale to submesoscale wavenumber spectra in Drake Passage. J. Phys. Oceanogr., 46, 601–620. Rocha, C.B., S.T. Gille, T.K. Chereskin, and D. Menemenlis, 2016b: Seasonality of submesoscale dynamics in the Kuroshio Extension. Geophysical Research Letters, 43 (21), 11,304–11,311, doi:10.1002/2016GL071349. Simmons, H.L., S.W. Venayagamoorthy, and B.K. Arbic, 2004: Internal wave generation in a global baroclinic tide model. Deep-Sea Res. II: Topical Studies Oceanogr., 51, 3043–3068. Todd, R.E., D.L. Rudnick, M.R. Mazloff, B.D. Cornuelle, and R.E. Davis, 2012: Thermohaline structure in the California Current System: Observations and modeling of spice variance. Journal of Geophysical Research: Oceans, 117 (C2). Todd, R.E., D.L. Rudnick, M.R. Mazloff, R.E. Davis, and B.D. Cornuelle, 2011: Poleward flows in the southern California Current System: Glider observations and numerical simulation. Journal of Geophysical Research: Oceans, 116 (C2). Wang, D.-P., C.N. Flagg, K. Donohue, and H.T. Rossby, 2010: Wavenumber spectrum in the Gulf Stream from shipboard ADCP observations and comparison with altimetry measurements. J. Phys. Oceanogr., 40, 840–844. Wang, J., L.-L. Fu, B. Qiu, T. Farrar, and D. Menemenlis, 2016: An observing system simulation experiment (OSSE) on the design of an in-situ observing system for the CalVal of SWOT SSH measurement. Wunsch, C. and P. Heimbach, 2013: Chapter 21 - dynamically and kinematically consistent global ocean circulation and ice state estimates. Ocean Circulation and Climate A 21st Century Perspective, G. Siedler, S. M. Griffies, J. Gould, and J. A. Church, Eds., Academic Press, International Geophysics, 553 – 579, doi:10.1016/B978-0-12-391851-2.00021-0.